Fans of The Twilight Saga will be enthralled by this riveting story of Bree Tanner, a character first introduced in Eclipse, and the darker side of the newborn vampire world she inhabits. Bree Tanner can barely remember life before she had uncannily powerful senses, superhuman reflexes, and unstoppable physical strength. Life before she had a relentless thirst for blood...life before she became a vampire. All Bree knows is that living with her fellow newborns has few certainties and even fewer rules: watch your back, don't draw attention to yourself, and above all, make it home by sunrise or die. What she doesn't know: her time as an immortal is quickly running out. Then Bree finds an unexpected friend in Diego, a newborn just as curious as Bree about their mysterious creator, whom they only know as her. As they come to realize that the newborns are pawns in a game larger than anything they could have imagined, Bree and Diego must choose sides and decide whom to trust. But when everything you know about vampires is based on a lie, how do you find the truth? In another irresistile combination of danger, mystery, and romance, Stephenie Meyer tells the devastating story of the newborn army as they prepare to close in on Bella Swan and the Cullens, following their encounter to its unforgettable conclusion. The Short Second Life of Bree Tanner is an amazing addition to Eclipse, telling the events that happen through the eyes of one of the newborns that Victoria created. Normally it is told through Bella point of view, though in this case Bree Tanner is the main character, you can tell from her thought and how she talks she is only young and naïve, completely different to how Bella is. The story start with her getting changed into a vampire and how she reacts to new challenges that are being set out for her, you get to see the other newborns and how they interact with other, as in Eclipse you only get to see them briefly and don't get to know them as a person and not as a blood thirsty vampire. Though, this book you get to understand who they are and the events that took place when Victoria changed them into her own vampire army and what she has planned for each of them. It progresses really quickly from when they were turned into vampire till when they go to fight the Cullen's, though things don't turn out the way they or Victoria had once hoped they would and everything that had been planned fell apart all at once. Although, it doesn't take long for Bree to realise that the Cullen's are not the monsters that Victoria made them out to be. Bree knows that the newborns have been sent there to kill the Cullen's and anyone who gets in their way, but for some reason she doesn't want to kill anyone. Although things are not that simple, even if the Cullen's don't want to kill her, that doesn't mean that the Volturi will not. They do not take to kindly to having to travel from Italy to deal with a group of vampire who have been creating trouble in the Seattle area. 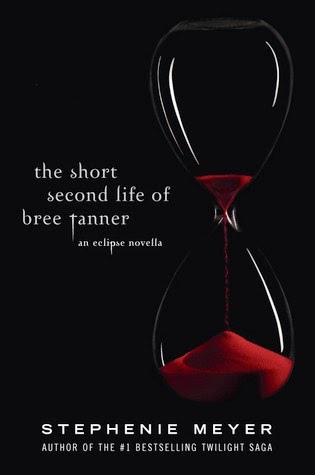 The Short Second Life of Bree Tanner is a brilliant novella to Twilight Saga Series, with the uniqueness of having a different point of view telling the events that lead them to where they are now and the precious moments that happened along the way. Don't forget to check out Day 1, Day 2 and Day 3 of The Twilight Saga Week. Don't forget to check out Day 5 - Breaking Dawn tomorrow.